Custom Loaf orders of 10 or more, please allow 4-6 weeks for delivery. These are handmade orders and it takes time for the soap to cure and harden. 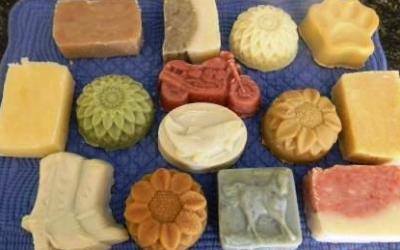 All-Natural soap made with vegan and essential oils. These soaps are made with only the finest ingredients. 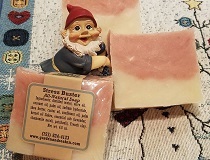 Each soap is made by hand in small batches. They are paraben-free, phthalate-free and sodium lauryl sulfate-free (No SLS). Garden and Sea Inn uses two processes to make our soap: hot or cold process. We use only natural colorants. This means they are derived from mineral, plant or animal as defined by the FDA. 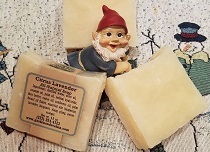 Citrus Lavender - is a subtle blend of tangerine, lavender, bergamot, ylang ylang and sweet orange essential oils. Ingredients: distilled water, olive oil, coconut oil, palm oil, sodium hydroxide, shea butter, castor oil, sunflower oil, palm kernel oil flakes, essential oils. 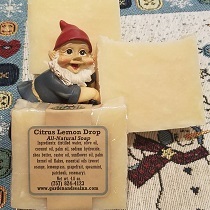 Citrus Lemon Drop - is an uplifting, refreshing blend of sweet orange, lemongrass, grapefruit, spearmint, patchouli and rosemary essential oils. 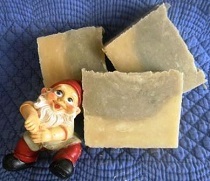 Eucalyptus Lemony Rosemary - is a great combination of aromatic essential oils. Eucalyptus is antiseptic, antibacterial and antiviral. Bugs don't care much for this scent either! Ingredients: distilled water, olive oil, coconut oil, palm oil, sodium hydroxide, shea butter, castor oil, sunflower oil, palm kernel oil flakes, essential oils, French clay. Euphoria - A floral scent of aromatic jasmine, wild rose and warm sandalwood. Ingredients: distilled water, olive oil, coconut oil, palm oil, sodium hydroxide, shea butter, castor oil, sunflower oil, palm kernel oil flakes, essential oil blend, French clay. 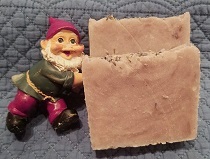 Garden Mint - A refreshing scent of lavender, rosemary and mint combined in a moisturizing soap perfect for something a little different. Ingredients: distilled water, olive oil, coconut oil, palm oil, sodium hydroxide, shea butter, castor oil, sunflower oil, palm kernel oil flakes, essential oils, parsley powder. Ingredients: olive oil, distilled water, coconut oil, sodium hydroxide, palm oil, castor oil, shea butter, essential oils (tea tree, peppermint, lavender), peppermint leaves, French clay. 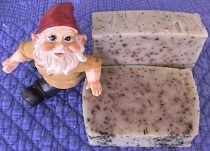 Lavender - Our popular relaxing floral lavender scent combined with moisturizing shea butter and all-natural oils. Ingredients: distilled water, olive oil, coconut oil, palm oil, sodium hydroxide, shea butter, castor oil, sunflower oil, palm kernel oil flakes, lavender essential oil, Brazilian clay, lavender buds. Lavender Eucalyptus Orange - A relaxing floral lavender scent with a hint of eucalyptus and sweet orange. Not too sweet and overpowering -- just right with lots of moisturizing lather. Ingredients: distilled water, olive oil, coconut oil, palm oil, sodium hydroxide, shea butter, castor oil, sunflower oil, palm kernel oil flakes, essential oils, Brazilian clay. Mint Eucalyptus - A refreshing mint and eucalyptus bar with moisturizing properties from olive, shea butter and sunflower oil. Ingredients: distilled water, olive oil, coconut oil, palm oil, sodium hydroxide, shea butter, castor oil, sunflower oil, palm kernel oil flakes, essential oils (spearmint, eucalyptus, rosemary, peppermint), French clay. Rain Forest - A wonderful clean, fresh woodsy blend. Great for men and women alike. So many bubbles and lather you can shave with this soap. Stress Buster - Stress be gone with this delicious blend of lavender, chamomile, neroli and patchouli with moisturizing shea butter.